Beautiful Smiles from South Africa! Don't have to say much......Just take a moment to see their smiles! We are very grateful to collaborate with Sesego Cares in South Africa. This was a part of our "BIG" campaign and we managed to send 50 dolls to children who live in the desert. This unique community is the oldest in the world, also one of the most special communities and people in our beautiful country. I thought it fitting for these members to receive the dolls. They stay in the desert. Once again thanks for the amazing support. This was just brilliant and inspirational! Last Wednesday night, November 8th, we celebrated "Thanks and Giving" evening with our very special friends. We are proud to announce that "1500 dolls to 1500 children" campaign was completed! AND.... we raised $2500 from this campaign. It's been almost 2 years since we've moved to our current office location. Yes, we are located at WeWork Penn Station. WeWork is a global network of workspaces where we share not only sharing spaces, but also information and building our communities and networks. 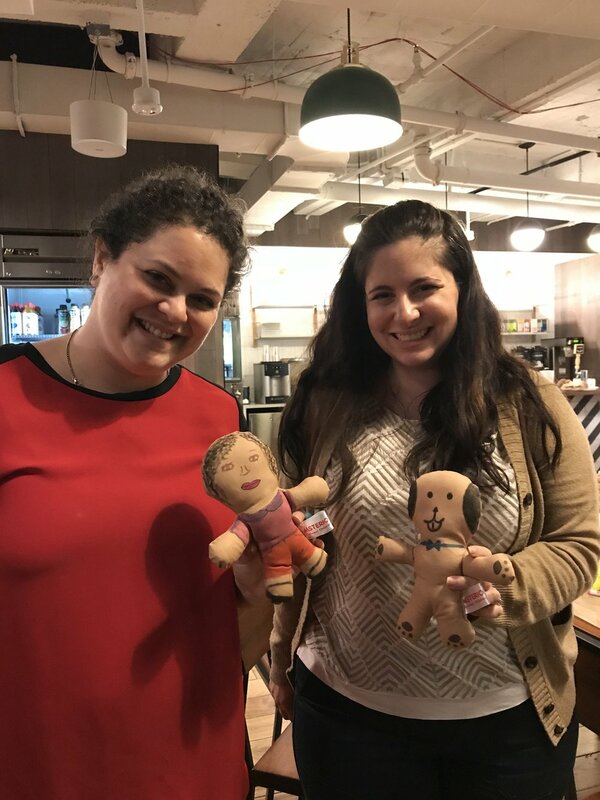 Thanks to Bill and Bianca at WeWork to give us a few opportunities to host the doll events in the past. 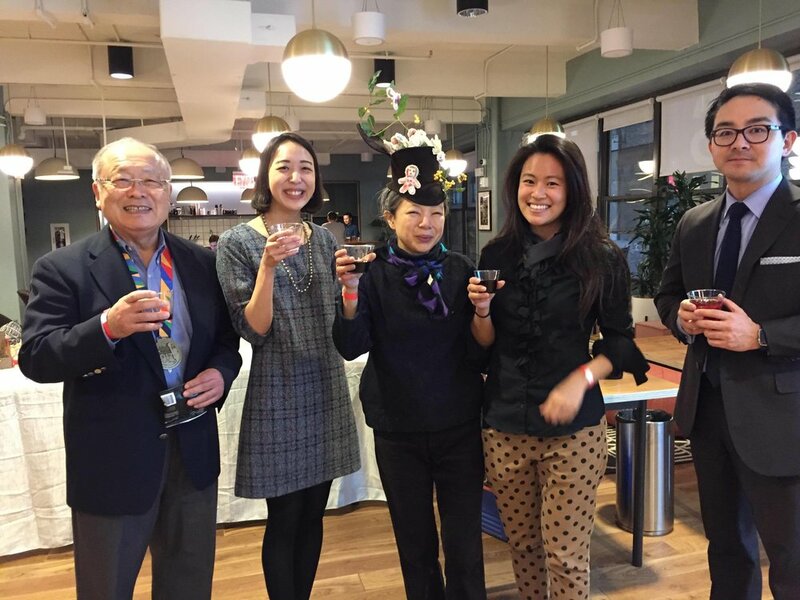 This time we were able to host an event at Wall Street WeWork. We were amazed how creative and unique each doll was! Remember, the dolls you've created and decorated are going to be part of our big campaign, so don't forget to check back where your dolls will travel to!! Have you RSVPed for "The Evening of Thanks and Giving Celebration" yet? It is next Wednesday night, 11/8 at WeWork Penn Station office in NY. Please check 1500 dolls big campaign. Admission free. Bring your friends and stop by for drinks and snacks! This week we had two great volunteer stuffing and sewing sessions. One is at Pfizer, one of the world's premier biopharmaceutical companies and AHRC in Bronx, an organization that helps over 15,000 adults with intellectual and developmental disabilities throughout the five boroughs. As a result, they made more than 200 blank dolls! Don't forget to join us for our FREE ADMISSION EVENT "Thanks and Giving" evening on November 8th (Wed) night in NYC. Recently we had a great school events at PS276 Battery Park School! Total of 100 wonderful 3rd grade children participated, and they made super special dolls. Special thanks goes to Freya who helped us decorate several dolls before the school event and she did a fantastic job explaining how MSTERIO dolls worked for her schoolmates. These 100 dolls are part of our "1500 Big Campaign". Thanks to our friend Celeste who is an amazing artist for hosting a special "Doll Decorating party" at Ingrid's Gymnastics in Birmingham, Alabama. The place is owned by Celeste's mom Ingrid. The girls decorated more than 60 dolls, and more to come. They will be part of our "BIG" November campaign to send 1,500 dolls to South Africa, Mexico, India and other places. Don't forget to RSVP for our event "Evening of Thanks and Giving with MSTERIO" on November 8th in NYC. We cannot wait to celebrate our completion of the "BIG" campaign with you! 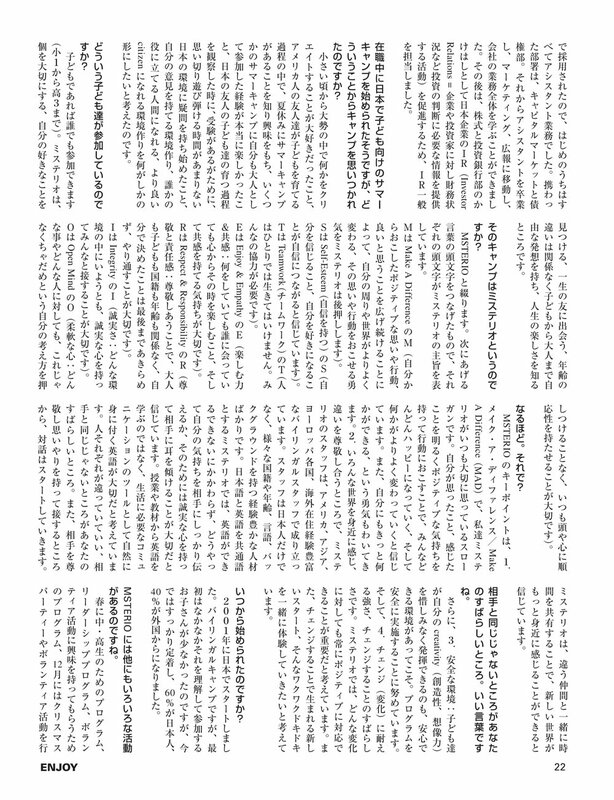 Although it is written in Japanese, we would like to introduce an interview article as Nozomi Terao, Founder and Executive Director was interviewed by a Japanese magazine called ENJOY. During her interview, she talked about her childhood, her passion and dream. One of our dedicated volunteers Kazushi and Tomiko hosted a very special party at their home on one Sunday afternoon in NY. The party was not only a gathering but also it was Kazushi's birthday! These unique and beautiful 60 dolls will be part of MSTERIO’s November campaign to send 1,500 dolls to South Africa, Mexico, India and more. We cannot thank them enough for what they've done for us! On our previous blog post we asked everyone to help decorate 1,500 dolls. GUESS WHAT!! We are about to complete and meet our goal very soon. On November 8 (Wed) night at our office, we are inviting YOU to celebrate our completion of this campaign. Bring your friends and stop by for drinks and light snacks. Your support ALWAYS makes a big difference and help to connect children around the world. 1500 Children Are Waiting for Your Support! Picture story: Banromsai, the orphanage for kids afflicted with AIDS in Thailand. Please help us decorate 1,500 dolls! Yikes! Yes, that's how many we need to send out by early November. No donation required. Just take care of the postage to send the dolls over to you. 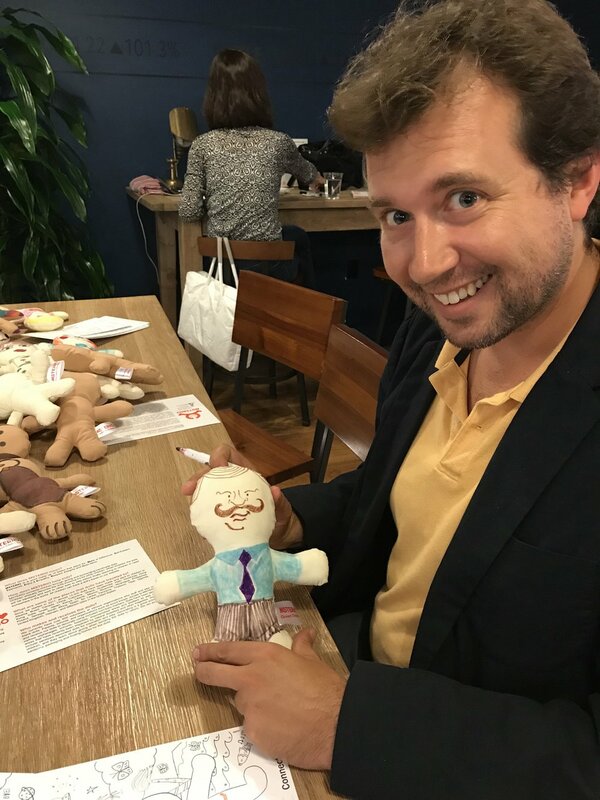 We need to send dolls to many places in Africa, India, and Mexico, and now children affected by our current natural disasters. Your support will make a big difference and help to connect children around the world. Just drop us an email at info@msterio.org if you are interested in help to decorate.